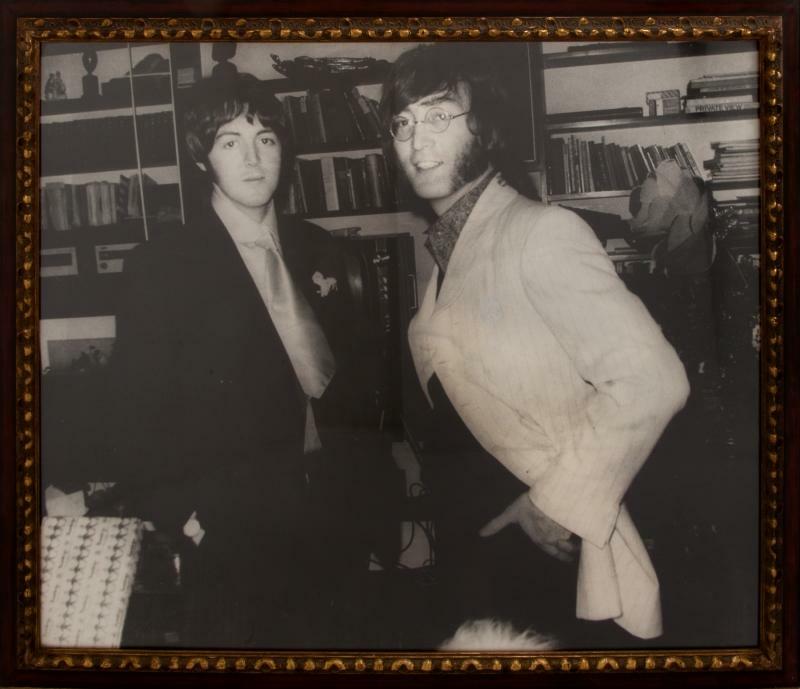 Some time in 1968 (My guess that it was taken in February), Paul McCartney and John Lennon posed for this lovely photo inside of Paul's home on Cavendish Avenue. If you look, you can see some of Martha's fur at the bottom. It really is a great Lennon-McCartney photograph. Somewhere along the line, the photo was blown up to 42 by 48 inches and put on a board. Then it was framed up and do you know where it ended up? It was in the Apple offices, hanging over the white fireplace. I am not sure how long it stayed there, but it wasn't there when I was there in 2017. Alright, I am just joking about that one -- of course, I didn't think there would be any Beatles stuff left inside of the Abercrombie & Finch children's clothing store that now occupies 3 Savile Row. Honestly, I am not even sure if that is the same white fireplace. 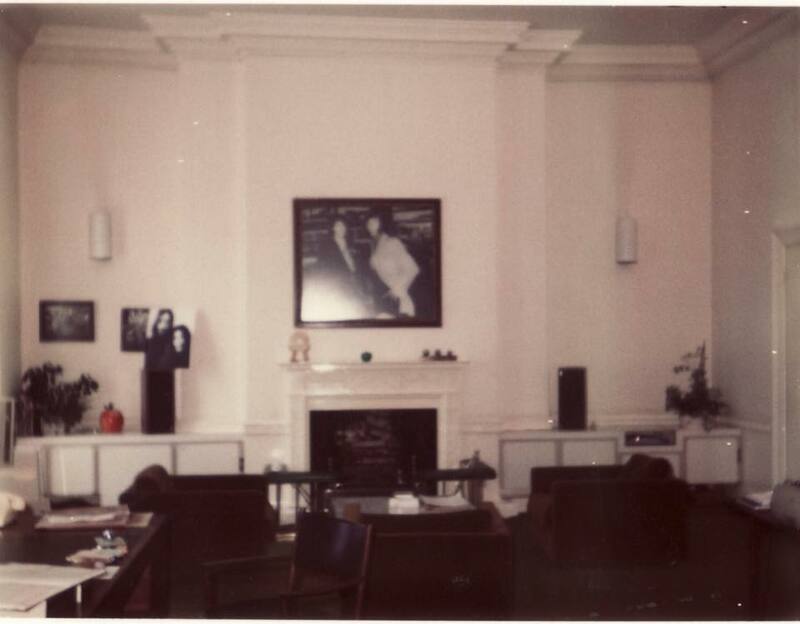 So where did the John and Paul portrait end up? In Ringo's possession -- where else? I am not sure where Ringo had this hanging in his home, or even why he wanted it -- except that it is a really nice photo of his two friends. But it was sold in 2015 as part of Ringo's auction with Juliens. Whoever owns it now paid $6,400 for it. I wonder if they know that it originally hung inside of Apple Offices? As I recall, this photo of John and Paul was taken by Ringo. At the same time that this photo was shot, Ringo also took a series of photos of each Beatle family (including one of himself and his own family) specifically for inclusion in Hunter Davies' Beatles Authorized Biography in 1968. So Ringo had the photo not only because it was of his two band mates, but because he took it. That does make sense. I have the photos he took for the Hunter Davies book. The prints were fan club exclusives if you ordered the book through the fan club. Too bad this shot wasn't included. I never put together that Ringo took it. Ringo has a good eye for photography. This really is one of the best Lennon-McCartney photos. Thanks for your input, Mark! Fab way of writing a narrative about a Beatles moment instead of recycling twice-told-tales - - tracing the life and times of the photo itself. lovely photo and story thanks! I absolutely love this photo, wish I had a printed copy of it. A longtime autograph collector friend of mine in Dallas has this very photo of John and Paul signed by John and Paul. It's absolutely 100% authentic -- signed by each, separately, over the course of two consecutive nights in New York City at the time of Elton John's Madison Square Garden show in November '74 (when Lennon made a special guest appearance on stage). My friend has had the autographed photo since around 1975, shortly after it was signed, purchased directly from the guy who got the two signatures in person. I also believe there are photos taken of both Beatles at the time of the signings. Now get this. In 1975, he paid a whopping $55 for it. When he told me this around 1976, I remember thinking that the price was exorbitant! But that was the going rate at the time. That is amazing, Mark - wow!